Quark is a fictional character in the American television series Star Trek: Deep Space Nine. 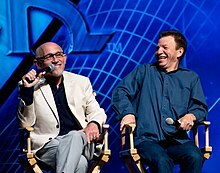 The character, which was played by Armin Shimerman, was depicted as a member of an extraterrestrial race known as the Ferengi, who are stereotypically capitalist and motivated only by profit. Quark, who often served as the show's comedy relief, may have been named after the 1970s television series Quark, which frequently examined science fiction themes from a humorous or satirical perspective. Before opening a bar, known as Quark's, on the station, Quark served as a cook aboard a Ferengi freighter for eight years. Quark came to the station while it was named Terok Nor during the Cardassian occupation of Bajor. Originally, Quark admired the Cardassian race for their version of morality, but later he seemed to take pity on the downtrodden Bajoran people, selling them food and equipment just above cost, which could have gotten him into serious trouble if the Cardassians had found out. When the station changed hands at the end of the occupation, Quark decided to leave the station. Commander Sisko, feeling that Quark's Bar (which offered holosuites and gambling) would encourage commercial tourism to boost the station's economy, extorted Quark to stay, using Quark's nephew Nog as a bargaining chip, in the Deep Space Nine pilot episode, "Emissary". Quark nevertheless continued to conduct a variety of shady deals while on the station, but neither Sisko nor the Bajoran authorities took many punitive actions against him, partially because Quark's position in the station's business community and contribution to station tourism outweighed the trouble caused by his activities, which were legal under Ferengi law and, for the most part, harmed no one. This was also largely because of the Federation's policy of non-interference in the internal affairs of other races, which extended even to the Ferengi and their business dealings (their lack of Federation membership notwithstanding). Furthermore, the station's status as, technically, the property of Bajor and thus only nominally a Federation station, sometimes prevented Sisko from prosecuting Quark to the full extent of Federation law; Sisko was not allowed such latitude with criminals who were also Federation citizens, such as his own lover, Kasidy Yates, whom Sisko was once obliged to arrest for dealing in illicit replicators yet, on the same occasion, obliged to allow Quark relative amnesty for dealing in illicit weapons. In the episode "Business as Usual", Sisko admitted that he had "cut [Quark] a lot of slack in the past [and] even looked away once or twice when [he] could have come down hard." However, Sisko's leniency didn't prevent Odo, Deep Space 9's chief of security, from regularly interfering with Quark's illegal doings. A shrewd businessman, Quark often quotes the Ferengi Rules of Acquisition. When the Bajoran wormhole was discovered, Quark helped broker deals between several Gamma Quadrant races and the Ferengi. The Alpha Quadrant's first knowledge of the Dominion came through business dealings that Quark and the Ferengi had in the Gamma Quadrant with the Karemma of the Dominion. Quark's role in these dealings came about as a result of the interference of Grand Nagus Zek. Quark became Grand Nagus for a brief period when it appeared that Zek had died; however, Zek's death turned out to be a ruse and Quark was promptly deposed. Along with Commander Sisko, Quark was also among the first to encounter the genetically engineered soldiers of the Dominion, the Jem'Hadar. 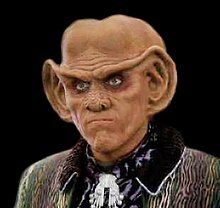 Quark repeatedly clashed with FCA (Ferengi Commerce Authority) liquidator Brunt, who believed that Quark was detrimental to Ferengi society and beliefs. The two met initially in a scandal involving Quark's mother Ishka, who had earned profit despite this being illegal for a female. Following this, Brunt was responsible for Quark receiving a savage beating at the hands of Nausicaan thugs. The attack was meant to coerce Quark into dissolving the employee union founded by his brother, Rom. Instead, Quark secretly honored many of the union's demands. Later, when Quark was falsely diagnosed with a fatal disease, Brunt anonymously bought the Ferengi bartender's remains six days in advance. When Quark discovered he was not dying and backed out of the contract, Brunt revoked Quark's business license with glee, but Quark's friends supplied him with all the equipment necessary to continue operating his bar anyway. (The license was later reinstated as part of a deal between Quark and Brunt to break up Zek and Ishka, who had begun a relationship.) When Brunt almost became Grand Nagus, Quark temporarily became a female named Lumba. This was in order to convince FCA commissioner Nilva that allowing Ferengi females to wear clothing was an opportunity for profit. Brunt did not believe the charade for a minute. Nilva, owner of Slug-O-Cola: "The Slimiest Cola In The Galaxy! ", on the other hand, was more than convinced that Lumba was a woman, and chased "her" amorously. Quark, Rom and Nog do not understand or speak English/Federation Standard, but rather rely on Universal Translators implanted near their ears ("Little Green Men"). Quark loved his brother Rom, and occasionally even found him useful. Nonetheless, in true Ferengi fashion, he treated Rom with little respect and ordered him about like a servant. Quark was also fond of swindling Rom out of his share of the bar's profits. They were partners in many other business ventures, although Quark routinely made sure to keep Rom in the dark about the true nature of their dealings. Quark's nephew, Nog, also briefly worked in his uncle's bar, before departing for Starfleet Academy. Rom eventually succeeded Zek as Grand Nagus, largely through the machinations of Ishka. Quark's relationship with his mother Ishka was tumultuous at best. She drove him to distraction with her untraditional ways. Ishka insisted upon wearing clothing and making profit. She was the financial mastermind in the family. However, Quark's father Keldar refused to listen to her advice simply because she was female. Ishka reluctantly revealed to Quark that he was a lot like her, while Rom was more like his father. She became Zek's lover and trusted advisor. Throughout the series, Quark was often locked in a battle of wits with station security chief Odo, who regularly foiled Quark's criminal schemes. The two eventually developed a grudging respect for each other. When Odo finally left the station to rejoin the Great Link at the end of the series, Quark came to say goodbye, and made a toast to Odo. Quark also had a firm friendship with Jadzia Dax, with whom he often played tongo. Although Quark presented himself as amoral and ruthless, he deeply cared for his friends. In "Move Along Home" when he was apparently forced to sacrifice one of four crew members (Sisko, Dax, Bashir and Kira) in a strange alien game, he refused to make a choice, begging for their lives. Quark has had his share of romances throughout the series. In the first season, he was involved with Vash, a corrupt archaeologist first introduced in Star Trek: The Next Generation. He was married to (and divorced from) a Klingon (Grilka) in an incident that also garnered him considerable respect from the Klingon community for his bravery, when he exposed how her husband's rival had tried to attack his House through business measures rather than a straightforward duel and then provoked said rival into trying to kill Quark in a duel when Quark was unarmed and had freely acknowledged that he would lose. He had a recurring Cardassian love interest (Natima Lang), was shown on several occasions to be attracted to both Major Kira Nerys and Lieutenant Commander Jadzia Dax, and once tried to seduce a Vulcan member of the Maquis (although this may have been motivated by his own efforts to find out more about the group). He also had a platonic affair with Pel, a female Ferengi posing as a male in order to make profit. In the non-canon novels set after the series, Quark starts a romantic relation with Ro Laren who has taken Odo's place as head of security. The Mirror Universe version of Quark appeared only once, in the episode "Crossover". At first he appears much the same as his regular counterpart (although mirror Quark has no idea what 'gold pressed latinum' - a staple of Ferengi currency - is), but it's soon revealed that mirror Quark is actively helping Terran slaves escape the cruelty of the Klingon/Cardassian Alliance. This version of Quark is eventually caught and executed when his activities are discovered. Armin Shimerman first appeared as Quark in the Star Trek: The Next Generation, season seven episode "Firstborn", where in conversation it is clear Riker already knew him, and in the Star Trek: Voyager pilot "Caretaker". He also played the character Quark on The Tonight Show with Jay Leno and Regis & Kathie Lee. Quark is featured in Star Trek novels published by Pocket Books. This includes books written by the actor that played Quark. In the Star Trek franchise books are based on film and television canon, but are themselves not; in other words the television and films provide the background for books and comics. In 2018, The Wrap ranked Quark as the 25th best main cast character of Star Trek overall. They note Quark as a "valuable ally to Sisko when the chips are down". One of the famous Star Trek episodes featuring Quark is "Little Green Men" (S4E8, November 13, aired 1995) ranked by Hollywood Reporter in 2017 as the 18th best episode of Star Trek: Deep Space Nine. In 2016, ScreenRant rated Quark as the 17th best character in Star Trek overall, highlighting the character as a commentary on the human condition. ^ a b "The 20 Best Characters In Star Trek History". ScreenRant. 2016-11-19. Retrieved 2019-03-20. ^ "'Star Trek: Deep Space Nine' — The 20 Greatest Episodes". The Hollywood Reporter. Retrieved 2019-03-20. ^ "The 20 Best Characters In Star Trek History". ScreenRant. 2016-11-19. Retrieved 2019-03-20. This page was last edited on 20 March 2019, at 15:45 (UTC).